The Nyingma tradition is the oldest of the four major schools of Tibetan Buddhism (the other three being the Kagyu, Sakya and Gelug). «Nyingma» literally means «ancient,» and is often referred to as the «school of the ancient translations» or the «old school» because it founded on the first translations of Buddhist scriptures from Sanskrit into Tibetan, in the eighth century. In modern times the Nyingma lineage has been centered in Kham in eastern Tibet. The Nyingma tradition actually comprises several distinct lineages that all trace their origins back to the Indian master Padmasambhava (Sanskrit for «lotus-born»; Tib. Guru Rinpoche, «precious master»), the legendary founder of Tibetan Buddhism. Nyingma followers maintain the earliest Vajrayana teachings (the other three schools are known as Sarma or «new translation» schools, having arisen from a second wave of translation). Followers of the tradition are known as «Nyingmapa,» «pa» being a common suffix comparable to «er» or «ite» in English. In 817 CE, King Trisong Detsen invited Padmasambhava and the Nalanda University abbot Shantarakshita (Tibetan Shiwatso) to Tibet to introduce Buddhism in the «Land of Snows.» King Trisong Detsen ordered the translation of all Buddhist Dharma Texts into Tibetan. Padmasambhava, Shantarakshita, 108 translators, and 25 of Padmasambhava’s nearest disciples worked for many years in a gigantic translation-project. The translations from this period formed the base for the large scriptural transmission of dharma teachings into Tibet. Padmasambhava supervised mainly the translation of Tantra; Shantarakshita concentrated on the Sutra-teachings. Padmasambhava and Shantarakshita also founded the first Buddhist monastery Samye on Tibetan ground. It was the main center for dharma transmission in Tibet during this age. The miracle-powers of the 25 disciples of Padmasambhava are widely accepted among Tibetan Buddhists. These disciples were: King Trisong Detsen, Namkhai Nyingpo, Nub Chen Sangye Yeshe, Gyalwa Choyang, the princess of Karchen Khandro Yeshe Tsogyal, Palgyi Yeshe, Palgyi Senge, the great translator Vairotsana, Nyak Jnanakumara, Gyalmo Yudra Nyingpo, Nanam Dorje Dudjom, Yeshe Yang, Sokpo Lhapal, Nanam Zhang Yeshe De, Palgyi Wangchuk, Denma Tsémang, Kawa Paltsek, Shupu Palgyi Senge, Dré Gyalwe Lodro, Drokben Khyenchung Lotsawa, Otren Palgyi Wangchuk, Ma Rinchen Chok, Lhalung Palgyi Dorje, Langdro Konchog Jungné and Lasum Gyalwa Changchup. From this basis, Tantric Buddhism was established in its entirety in Tibet. From the 8th until the 11th century, the Nyingma was the only school of Buddhism in Tibet. With the reign of King Langdarma (836–842) a time of political instability ensued which continued over the next 300 years, during which time Buddhism was persecuted and largely forced underground. From the 11th century onwards, the Nyingma tradition flourished along with the newer Sarma schools, and it was at that time that Nyingmapas began to see themselves as a distinct group and the term «Nyingma» came into usage. The Nyingma tradition is unique among the four schools in that its supporters never held political power, and therefore it stood at a greater remove from the political machinations of Tibet. It is also distinguished by its decentralization and lesser emphasis on monasticism relative to the other schools, with a correspondingly greater preponderance of «ngakpas», uncelibate householders and yogins. The structure of tantric teachings of Nyingma is significant aside from the terma-tradition. Nyingma-Schools decide 6 levels of tantric teachings; in other schools, 4 levels are common. In the later schools the inner tantric teachings are known as Anuttarayogatantra, which corresponds to Mahayoga in the Nyingma system, while the Mahamudra teachings of the later schools are said to lead to similar results as the Dzogchen teachings. The appearance of terma («hidden treasures») is of particular significance to the Nyingma tradition. Although there have been a few Kagyupa «tertons» (treasure revealers) and the practice is common in Bön as well, the vast majority of Tibetan Buddhist tertons have been Nyingmapas. It is believed that past masters, principally Padmasambhava, hid teachings for discovery by a later terton at the appropriate time for the teaching to be beneficial. These teachings may be physically discovered, often in rocks and caves, or they may be «mind terma,» appearing directly to the mind of the terton. Padmasambhava and his main disciples hid hundreds of scriptures, ritual objects and relics in secret places to protect Buddhism during the time of decline under king Langdarma. These termas were later rediscovered and special terma lineages were established throughout Tibet. Out of this activity developed, especially within the Nyingma tradition, two ways of dharma transmission:The so called «long» oral transmission from Teacher to student in unbroken lineages and the «short» transmission of «hidden treasures».The foremost revealers of these termas were the five terton kings and the eight Lingpas. In the 19th century some of the most famous were the Khen Kong Chok Sum referring to Jamyang Khyentse, Jamgon Kongtrul and Chokgyur Lingpa. Many tertons were incarnations of the 25 main disciples of Padmasambhava. A vast system of transmission lineages developed through the ages. Nyingma scriptures were updated when the time was appropriate. 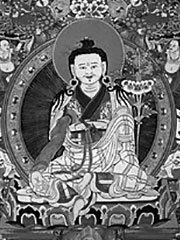 Terma teachings guided many Buddhist practitioners to realisation and enlightenment.The rediscovering of terma began with the first terton, Sangye Lama (1000–1080). Tertons of outstanding importance were Nyangral Nyima Oser (1124–1192), Guru Chowang (1212–1270), Rigdzin Godem (1307–1408), Pema Lingpa (1450–1521), Jamyang Khyentse Wangpo (1820–1892) and Orgyen Chokyur Lingpa (1829–1870). The terma tradition had antecedents in India; Nagarjuna, for example, rediscovered the last part of the «Prajnaparamita-Sutra in one hundred thousand verses» in the realm of Naga, where it had been kept since the time of Buddha Shakyamuni. It is generally agreed that Longchenpa and Mipham are the two most important scholars to the Nyingma lineage. During the ages, many great scholars and tantric Masters appeared within the Nyingma lineage. Most famous of all is the master and scholar Longchenpa (Longchen Rabjam), who, along with Rongzom Mahapandita, is known as «omniscient one» or kun kyen – a title only bestowed upon these two masters in the Nyingma school. He wrote many scriptures on the whole Nyingma-dharma. He is especially known for his presentation of the Nyingma philosophical view, that of Dzogchen in particular. His main works are the «seven treasuries» (Dzö dün), «three cycles of relaxation» (Ngalso Korsum), «three cycles of natural liberation» (Rangdröl Korsum) and the three «inner essences» (Yangtig Namsum). Longchen Rabjam also systematized the transmission of Dzogchen, the Great Perfection, in a collection of texts called «The Four-fold Heart Essence» (Nyingthig Yabzhi). Jigme Lingpa further condensed the Nyingthig Yabzhi of Longchenpa into a cycle of termas called the Longchen Nyingthig, or «Heart Essence of the Vast Expanse». The Nyingthig Yabshi and the Longchen Nyingthig are known, respectively, as the earlier and later «heart essence.» The Longchen Nyingthig became both the foundation of the main Dzogchen teachings in the contemporary period and of the Rime movement. Jigme Lingpa’s teaching lineage flourished in Kham (eastern Tibet) around Dege, and after his death three incarnations were recognised as being his emanations: Do Khyentse (1800?-1859? ), Jamyang Khyentse Wangpo, (1820-1892) and Patrul Rinpoche, (1808-1887), all of whom were central to the Rime movement. The Rinchen Terdzod is, along with the Longchen Nyingthig, the most important terma treasure to Nyingmapas today. It is the assemblage of thousands of rare terma texts from all across Tibet by Jamyang Khyentse Wangpo, Jamgon Kongtrul Lodro Thaye, and Chogyur Dechen Lingpa in the 19th century. Mipham Jamyang Gyatso (“Mipham the Great”) was born into an aristocratic family in 1846 in Kham, a province of eastern Tibet. His name, Mipham Gyatso, means “Unconquerable Ocean,” and as a scholar and meditator he was so accomplished that he was enthroned as an emanation of the Manjushri, the bodhisattva of wisdom. As such, he was asked to compose a definitive articulation of the philosophical outlook of the Nyingma lineage. This had never been systematized in the manner of the other four lineages and, as a result, was vulnerable to attack by hostile scholars. As requested, Mipham Rinpoche composed authoritative works on both the Sutric and Vajrayana teachings as understood in the Nyingma tradition, writing particularly extensively on dzogchen. He is said to have composed these vast works effortlessly. They reinvigorated and revitalized the Nyingma lineage enormously inestimably, and he soon became one of the most renowned lamas in Tibet, attracting disciples from all traditions, many of whom became lineage holders. Mipham’s works have become the foundation of study for not only the Nyingma lineage, but the Kagyu lineage as well. They hold a central position in all Nyingma monasteries and monastic colleges. Along with Longchenpa, he is considered the source of the Nyingma doctrine. Tradition has held that there are six monasteries known as «mother monasteries» of the Nyingma lineage, although there have been slightly different formulations of the six. At one time they included Dorje Drag, Mindrolling and Palri monastery in Upper Tibet; and Kathok, Palyul and Dzogchen monasteries in Lower Tibet. After the decline of Chongye Palri Thegchog Ling monastery and the flourishing of Shechen, the mother monasteries became Dorje Drag and Mindroling in the upper region, Shechen and Dzogchen in the center, and Kathok and Palyul in the lower part of Tibet. Dodrubchen is often substituted for Kathok in the list. Out of these «main seats of the Nyingma» developed a large number of Nyingma monasteries throughout Tibet, Bhutan and Nepal. Also of great importance to the Nyingma lineage is Samye, the first Tibetan monastery, founded by Shantarakshita. Among authentic contemporary Nyingma teachers are His Holiness Thinley Norbu Rinpoche, His Holiness Kyabje Dudjom Rinpoche (c. 1904–1987), His Holiness Dilgo Khyentse Rinpoche (c. 1910-1991), Tulku Urgyen Rinpoche, His Holiness Penor (Pema Norbu) Rinpoche, Khenpo Choga Rinpoche, filmmaker Khyentse Norbu (son of H.H. Thinley Norbu Rinpoche, and also known as Dzongsar Jamyang Khyentse Rinpoche), and Chagdud Tulku Rinpoche, among many others.